Colbalt aura Quartz Crystal crown! 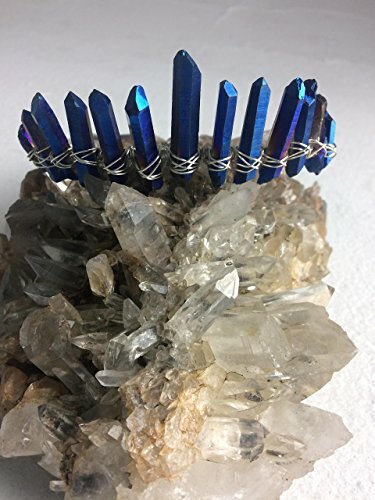 These aura Quartz crystals are wrapped in silver wire and attached to a steel metal headband. Beautiful and lightweight crown or headband. Shines beautifully in the sunlight. Accepting custom orders! Perfect for weddings, prom, cosplay, festivals and many other special occasions! ***Please note these are real crystals and therefore an organic natural material and have different shapes, no two are the same. Your crown will look as close to the photo as possible but may be slightly different. I always put the tallest Crystal in the middle. *** Flame (cobalt) Aura Quartz - Clear Quartz bonded with Titanium and Niobium; produces very deep blue, violet and golden metallic crystals; also called Titanium Aura Quartz. This crystal is excellent for use in spiritual initiations and rituals, and for deepening meditation and spiritual attunement. It creates a multi-dimensional energy shift, drawing kundalini energy up the spine and through the subtle bodies, adjusting its effect to provide what each soul needs for evolution. It may also be used during meditation to promoted contact with ancient Greek civilizations. Flame Aura stimulates the Third Eye and Higher Crown Chakras, enhancing focus and increasing the ability to "read" people at an energetic and subtle level and to understand the information that was communicated. It is a beneficial stone for creating and maintaining a state of homeostasis within the physical and emotional bodies, and may be useful in the treatment of diabetes, cellular and bone cancers, Multiple Sclerosis, and in stimulating the immune system of AIDS patients.